Model-based development methods, and supporting technologies, can provide the techniques and tools needed to address the dilemma between reducing system development costs and time, and developing increasingly complex systems. This book provides the information needed to understand and apply model-drive engineering (MDE) and model-drive architecture (MDA) approaches to the development of embedded systems. Chapters, written by experts from academia and industry, cover topics relating to MDE practices and methods, as well as emerging MDE technologies. Much of the writing is based on the presentations given at the Summer School “MDE for Embedded Systems” held at Brest, France, in September 2004. Jean-Philippe Babau is an Assistant Professor in the Computer Science department at INSA, Lyon, France. His research interests include the use of formal models for architecture description to build real-time embedded systems. Mireille Blay-Fornarino is Professor in computer science at University of Nice in France. She is also a researcher in Computer Science at the Computer Science and Automata Laboratory. Joël Champeau is a teacher-researcher in the New Technologies Development Laboratory at ENSIETA, Brest, France. He specializes in applying MDE methodology and techniques to a system modeling framework for embedded systems. 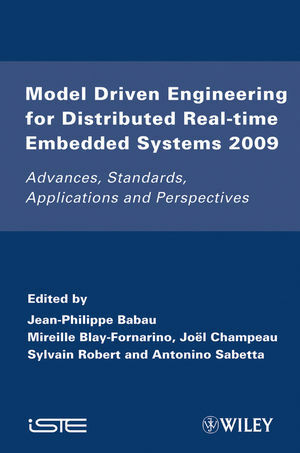 Sylvain Robert is editor of Model Driven Engineering for Distributed Real-Time Embedded Systems 2009: Advances, Standards, Applications and Perspectives, published by Wiley. Antonino Sabetta is editor of Model Driven Engineering for Distributed Real-Time Embedded Systems 2009: Advances, Standards, Applications and Perspectives, published by Wiley.